In stock -This product will ship today if ordered within the next 4 hours and 6 minutes. 90 Tablets for the price of 60! 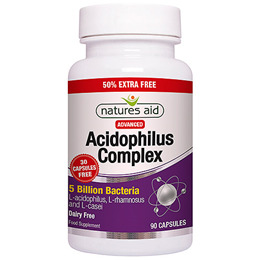 Natures Aid Acidophilus Complex provides three types of what are often known as `friendly bacteria`. These produce compounds such as lactic acid which helps to maintain a healthy digestive system by increasing the acidity and inhibiting the reproduction of many harmful bacteria. Microcrystalline Cellulose, Cellulose, Probiotic prep (Lactobacillus acidophilus, Lactobacillus rhamnosus, Lactobacillus casei), Anticaking Agents (Silicon Dioxide, Vegetable Source Magnesium Stearate). Take 1 vegicap 2-4 times daily. Below are reviews of Natures Aid Acidophilus Complex - 50% Extra FREE - 60+30 Vegicaps by bodykind customers. If you have tried this product we'd love to hear what you think so please leave a review. 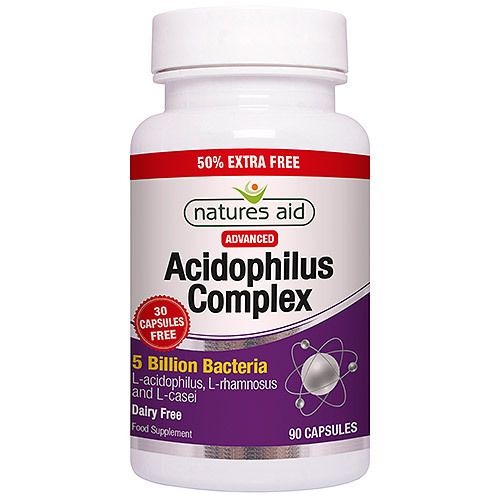 Natures Aid Acidophilus Complex provides three types of what are often known as `friendly bacteria`. These produce compounds such as lactic acid which helps to maintain a healthy digestive system.